My colleague has copied a new project (Document 2) from an old one (Document 1). They have edited Document 2. (resizing many parts). I've checked it, made some more changes and now I need to release it. I'm worried that in new Document 2 they have not changed the part numbers from those of Document 1. What happens when I release elements from Document 2? Will there be a conflict? I will do some tests/research in the meantime. As you have noted, copying a workspace will retain the part number properties. If you try to release the copied parts, a warning will be given, but it is still possible to submit for approval. The approver will also see the warning message and can then approve or reject the submission. What it won't do is permit the reuse of the same part number and the same revision number. This means you can create a brand new part in a brand new document to supersede another part you want to discontinue. Deleting the old docs/parts will remove the error message. 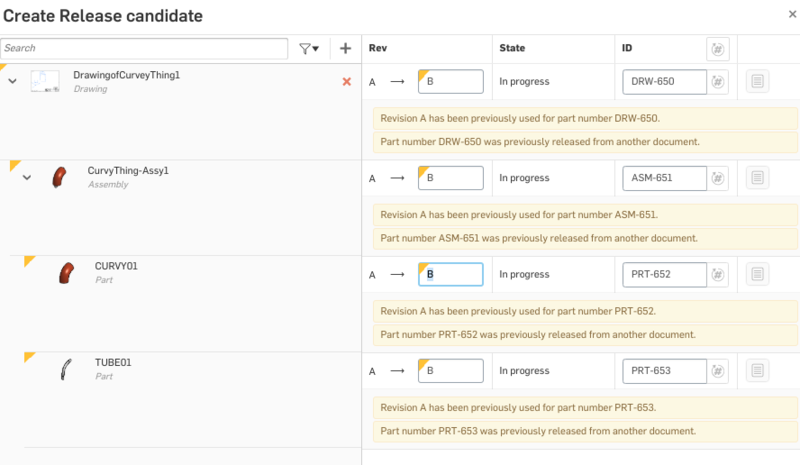 Changing the part number will also allow you to reset the revision counter for the part (since it is now a new part). With regard to auto-number generation, once the number is taken, it’s taken. Because Onshape is truly asynchronous there is always the possibility that 2 or more people could request part numbers at the same time so this is done to prevent duplication. And yes, Onshape uses internal IDs to track everything. If you override a part with a new part and release it so that it has the same number (but different rev) and replace it in the assembly you can still get the old part from the assembly history. However it will still have a different rev number so you should be ok. Thanks Neil. I'm testing it out now. It all seems to work perfectly. (details below). "..This means you can create a brand new part in a brand new document to supersede another part you want to discontinue..."
Interesting to know, but this worries me for some reason I can't put my finger on. The history of any of its assemblies would still show the old version of the part right? Is there another unseen internal id for the part that onshape uses to track this? It's also trying to increment the Revision from A to B. When I try to change the Bs to As, it pushes back to B and adds the additional warning..
"Revision A has been previously used for part number DRW-650" etc..
To fix, I deleted all the Part numbers and hit the auto-gen to get the next unique number. And then editing the text from rev B to rev A sticks this time, and clears all of the warnings! Not too laborious a workflow. Just need to be careful when filling out the release candidate.